Vanderbilt Beach is located in north Naples, between Bluebill Avenue (Immokalee Rd.) and Vanderbilt Beach Rd. just north of Pelican Bay. 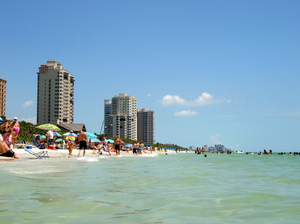 Beautiful white sand beaches along with a variety of Vanderbilt Beach condos line the Beach. The Vanderbilt high rise condominium is located directly on Vanderbilt Beach and offers outstanding floor plans and views. Moraya Bay, the newest luxury Vanderbilt Beach condominium is completed and offers state of the art amenities. There are other conveniences as well including the Turtle Club, an outstanding beach front restaurant. La Playa hotel is one of only a handful of beach front hotels in Naples and is truly a beautiful lodging option and the Ritz Carlton is also located on Vanderbilt Beach. Many of the buildings built in the early 70's have since become a great opportunity for second home ownership.